Librarian Little: The Sky is Not Falling!™: What Do You Like to Read? 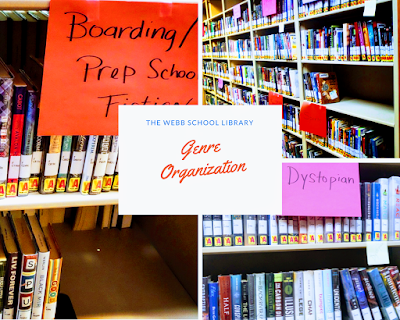 We are working on a new way of organizing books in The Webb School Library! We have organized the books into genre categories. Many of our patrons have asked for books in specific genre categories and now we will be able to serve patrons better in this way. Right now this is a work in progress so please bear with us as we organize using this new method.